Blog Renewable Biomethane – an Economic Alternative? Compressed natural gas (CNG) has several things going for it. It is cheaper than gasoline or diesel fuel, has lower emissions, and for a conventional piston-engined airplane, is the equivalent of over 130 octane, far more powerful than 100-octane low lead (100LL) and cleaner burning. CNG filling stations are growing across the country as fleet owners take advantage of the economics of converting their vehicles, but are still few and far between in the west, with the exception of California. There are under 900 stations throughout America. Alluring as CNG might be for drivers, pilots used to paying $5.50 per gallon for avgas should be charmed by CNG’s price of $1.00 per gallon equivalent. That is with conventional, fossil-based CNG, basically a storable version of natural gas. That leads to its less-desirable characteristics. First, it pollutes, too, and is a source of greenhouse gases. Second, natural gas has a hard time overcoming its association with fracking, or hydraulic fracturing – the injection of water, chemicals and sand into rock that contains natural gas. This forces gas from the fractured seams for collection. But it also leaves the underlying shale or rock formation weakened – possibly leading to earthquakes. Oklahoma, which has a disproportionate number of CNG distribution stations, also has a recent uptick in temblors. Beyond that, groundwater pollution is often associated with fracking and natural gas extraction. We’ve discussed liquid jet fuels made from municipal and farm waste in recent entries, and both United and Alaska Airlines have made flights fueled partly with non-fossil materials – even forest slash debris. 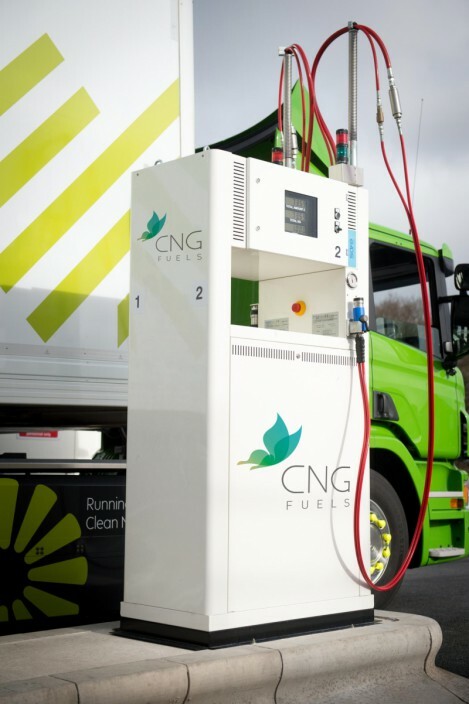 United Kingdom-based CNG Fuels purveys a renewable biomethane fuel, which they claim to be ”The most cost-effective and lowest-carbon alternative to diesel for heavy goods vehicles (HGVs). The fuel is 35%-40% cheaper than diesel, and emits 70% less CO2 on a well-to-wheel basis. It therefore offers fleet operators the chance to significantly reduce running costs and emissions.” Several British trucking firms have committed to using the new biomethane fuel for their long-distance haulers. England is small enough, and with an established high-pressure gas grid, that adding a network of refueling stations is reasonable and economically feasible for CNG. Whether operators will find the economics reasonable is another question. GNG “is targeting operators of high-mileage HGVs, who stand to make the biggest financial savings and carbon impact. Its customers’ vehicles travel an average of 125,000 miles every year, and CNG-powered trucks are more expensive than those that use diesel. Ford has sold a good many CNG/propane vehicles over the past decade, with sales growing annually. After paying for a $315 factory prep, a customer can take his large pickup to a “Ford Qualified Vehicle Modifier,” who will install the dual-fuel package for $7,500 to $13,000. Most who own big-rig pickups in commercial operations put enough miles on to justify the conversion costs. That price differential for storing compressed gas led to Honda’s attempt at a Civic using LNG/CNG to disappear quietly from the market. Its higher initial cost, indifferent performance, and lower fuel economy did not endear it to consumers. 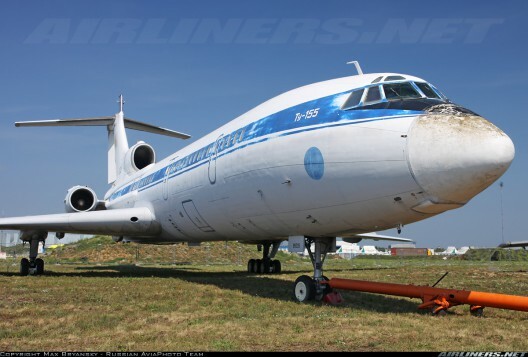 Russia’s Tupolev works attempted a hydrogen-powered airliner, the TU-155, in 1988, converted it to natural gas, but dropped the project with the fall of the Soviet Union. Seen at Oshkosh in 2014 outside the Innovation Pavilion, Aviat’s Husky with a large bulge underneath was flown on both 100 low-lead (LL) aviation gasoline and compressed natural gas. In a recent call to Bill Sullivan, he explained that the airplane had been an “engineering challenge,” but has not been offered for sale since its public display. He’s flown it on 100LL, and noted that CNG offered the equivalent of 130 octane. An engine would need higher-compression pistons and other modifications to take full advantage of the added potential of the fuel. The lack of lead in CNG might also produce great wear in the engine, that “LL” feature in aviation gas necessary for extending engine life. Questioned about the bulky fuel container, Sullivan explained that was a first-generation tank, and that later improvements had condensed that bulk considerably. We’re on the fifth generation currently. Range would be limited to what could be done on that single tank, since other airports in the region might not have GNG available. An entirely new infrastructure would be required to allow anything other than training flights mostly kept close to the departure airport. In this respect, CNG trainers would be restricted much like Pipistrel’s Alpha Electro trainer (until better batteries become available). If GNG can be made even cleaner by adding or substituting biomethane, several advantages accrue, including fewer emissions from the vehicle and less methane being released into the atmosphere from rotting plant matter. The fuel can be less expensive, but the necessity of modifying the vehicle to take advantage of that can be off-setting. This may be more easily accomplished in a compact, heavily agricultural land such as England, but harder to pull off in the far-flung reaches of America. As gas prices rise again (predicted to top $3.00 a gallon again early in 2017), fleet owners and airline magnates will look at economical solutions more favorably. Given changes in the political infrastructure, we might be surprised at the next turn in our ongoing story.